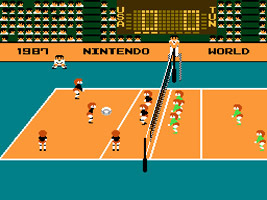 Videogame version of the popular ball game. Before each game the player can choose the team's gender and which nation they represent out of 8 countries. The aim is to hit the ball over the net and onto the ground on the side of your opponent's team. The ball can be passed around the court to other members of your team in order to take advantage of weak areas in the defense of the other team. You must also defend against the opponents grounding the ball on your side by moving the players to hit the ball.